[154 Pages Report] The global digital pathology market is projected to be valued at USD 383.9 Million in 2016 and is expected to grow at a CAGR of 12.3% from 2017 to reach to USD 756.1 Million by 2022. Growth in the digital pathology market is mainly driven by factors such as the growing applications of digital pathology in drug development and companion diagnostics, ease of consultation, increasing adoption of digital pathology to enhance lab efficiency, rising prevalence of cancer, and increasing initiatives by governments and industry players. Base year considered for the report is 2016 and the forecast period is 2017–2022. The prominent players in the global digital pathology market are Leica Biosystems (Germany), Ventana Medical Systems (US), Hamamatsu Photonics (Japan), 3DHISTECH (Hungary), and Philips (Netherlands). 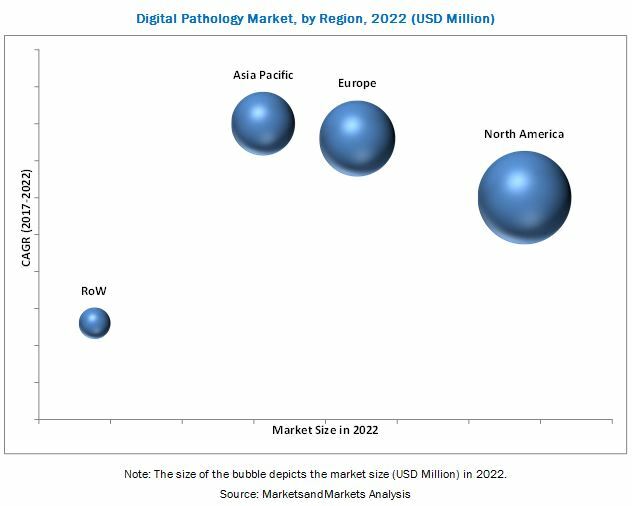 The global digital pathology market is projected to reach USD 756.1 Million by 2022 from USD 423.1 Million in 2017, at a CAGR of 12.3%. The key factors propelling the growth of this market include increasing initiatives by governments and industry players, ease of consultation, increasing adoption of digital pathology to enhance lab efficiency, rising prevalence of cancer, and growing applications of digital pathology in drug development and companion diagnostics. On the basis of product, the digital pathology market is categorized into scanners, software, communication systems, and storage systems. The software segment is projected to witness the highest growth rate in the forecast period, due to the availability of user-friendly, analytical, and advanced functions for pathology diagnosis. On the basis of type, the digital pathology market is segmented into human and veterinary pathology. The human pathology segment is expected to account for the largest share of the market in 2017. The increasing number of cancer research activities and growing collaborations between academic research institutes, universities, and pathology laboratories are driving the increased uptake of digital systems in human pathology. On the basis of application, the digital pathology market is segmented into disease diagnosis, teleconsultation, drug discovery, and training & education. The teleconsultation segment is estimated to account for the largest share of the global market in 2017. Shortage of pathologists in developing countries and increasing need for quality and fast diagnosis have enhanced the utilization of teleconsultation applications across the globe. On the basis of end user, the global digital pathology market has been segmented into pharmaceutical and biotechnology companies, hospitals and reference laboratories, and academic & research institutes. The pharmaceutical and biotechnology companies segment is estimated to account for the largest share of the global market in 2017. Key factors driving the growth of this segment is the usage digital pathology for biobanking, biopharmaceutical studies, and molecular assays. In 2017, North America is expected to account for the largest share of the digital pathology market, followed by Europe. The large share of the North American region can be attributed to factors such as increasing initiatives by industry players and governments in diagnostics and the rising prevalence of chronic diseases. The prominent players in the global digital pathology market are Leica Biosystems (Germany), Ventana Medical Systems (US), Hamamatsu Photonics (Japan), 3DHISTECH (Hungary), Philips (Netherlands), Apollo Enterprise Imaging (US), XIFIN (US), Visiopharm (Denmark), Corista (US), Huron Digital Pathology (Canada), Objective Pathology Services (Canada), and Indica Labs (US).